Ah, couture. The crème de la crème of the fashion world. Twice a year, the most esteemed fashion houses and the most influential names in the business convene in Paris for days of stunning, intricate, and beautiful clothing. Couture is the celebration of fashion in its purest form, essentially free from the need to be commercially successful. It allows the fashion designer to explore complicated themes and create exquisite, one-of-a-kind pieces. 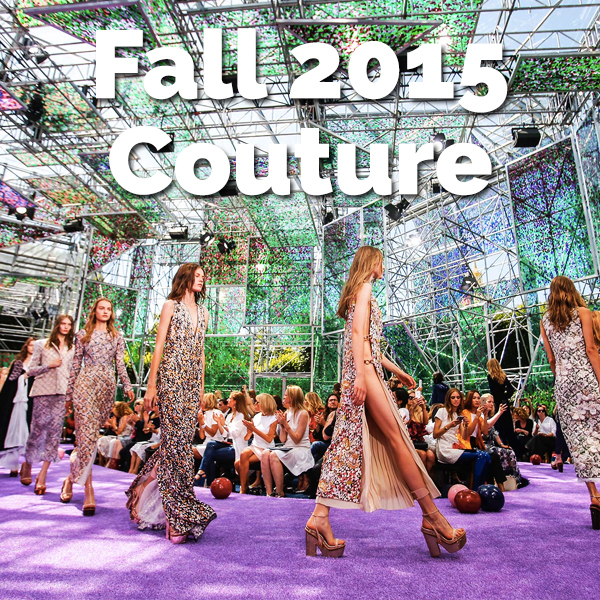 Couture celebrates craftsmanship, originality, and creativity. Indeed, couture is the highest of art forms in the world of fashion. 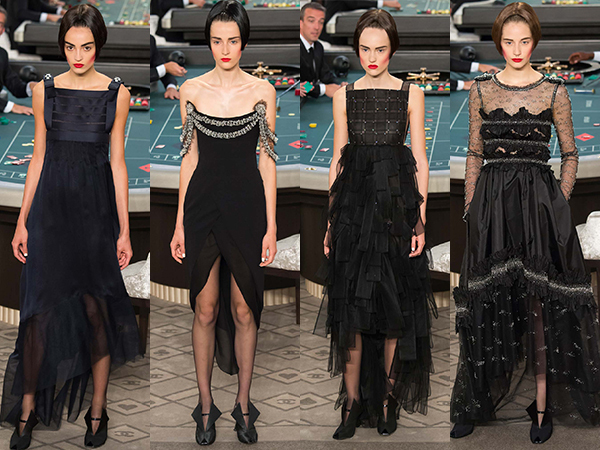 Let's discuss the Fall 2015 shows, then, shall we? 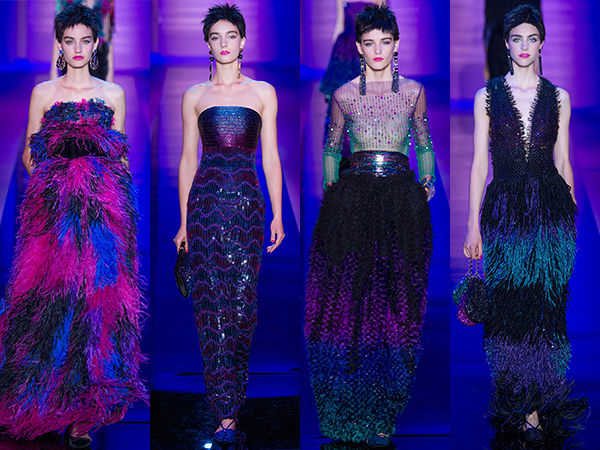 With blindingly vibrant shades of neon pink, electric blue, and radiant green, "Shocking" truly is a great title for the Armani Privé Fall 2015 couture collection. 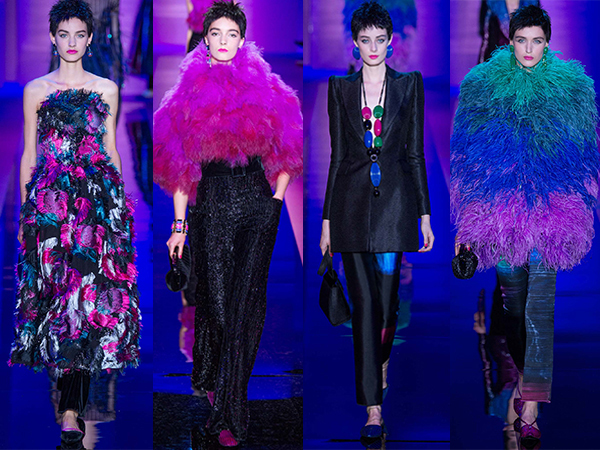 Armani's collection was deeply inspired by Elsa Schiaparelli and her signature hue, "shocking pink" (hence the title and the abundance of pink on the runway). This collection was full-on 80s luxe, with strong shoulders, androgynous forms—from the abundance of suits right down to the shaggy pixie cuts of the models—and a powerful, eye-catching color palette that can only be described as a cool sunset. This being a couture collection, there was no expense spared, no detail deemed too extravagant. That meant lots of feathers, sequins, crystals, and velvets. Luxe, indeed. As is usual with Armani Privé, we will be seeing plenty of these designs on red carpets in the coming months, and I cannot wait. Whoever is bold enough to wear these stunning designs (I especially cannot wait to see the final dress in action) is sure to make a splash. 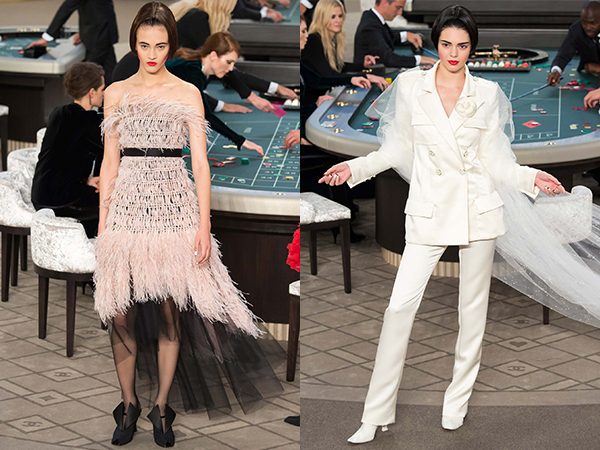 As usual, the set at the Grand Palais was incredibly creative and cheeky; for Fall 2015 couture, head designer Karl Lagerfeld had models walk through a Monte Carlo-style casino where Chanel muses like Julianne Moore, Kristen Stewart, and Lily Rose Depp sat at poker tables, gambling away while identical, robotic models passed by. Robotic being the key word here, because many of the early looks in the show were 3D-printed and created with computer technology. With handmade detail being so integral to the institute of couture, I'm not quite sure if 3D-printing technology has a place in high fashion, but you've got to give it to Lagerfeld for always being innovative and ready to try the newest thing. 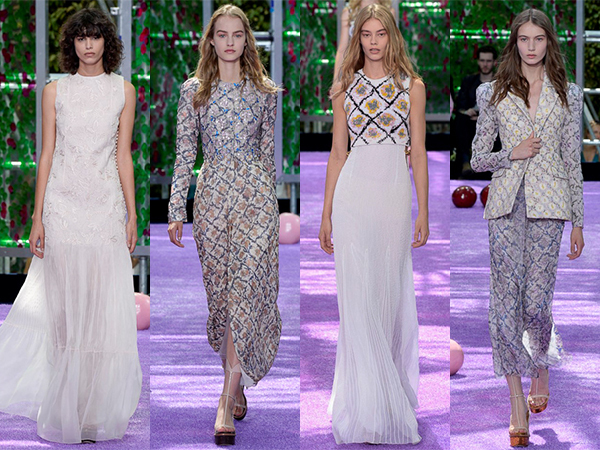 Stylistically, the daytime looks at the Chanel show just did not do it for me. Their odd stiffness is better explained when you consider the use of 3D-printing, but to be honest I often feel this way with Chanel shows as of late; the first half of the collection is repetitive at best, always the same tweed skirt sets and 1920s shapes that have been Chanel staples since the era of Mademoiselle Coco herself. The creative process might have been an innovative gamble (if we are to go with the casino theme) but the tweed suit is hardly a risk. But the second half. That's where the magic is with this collection. From frilly cocktail dresses to decadent gowns, these are the clothes that are going to sell with the couture crowd. Also, can we just talk about the la mariée suit worn by it-model Kendall Jenner? 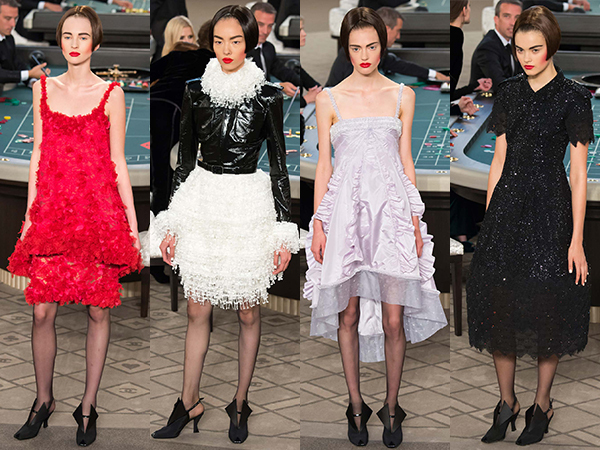 That is how you take elements of Chanel tradition and have some fun and innovation with it. Here's hoping some celebrity or high-fashion favorite is getting married soon and wanting to wear this, because this wedding suit needs a moment. Raf Simons is one of the—if not the—best designers in the business. He outdoes himself with each collection he delivers for Christian Dior, and to think I have gone from being skeptical of his appointment to absolutely ecstatic each time he does something new is crazy. 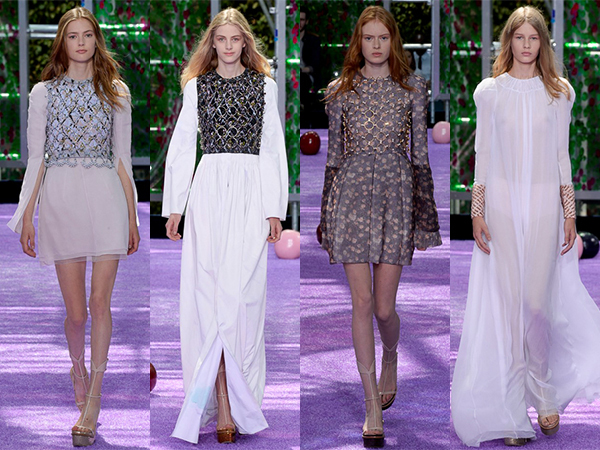 After delivering a knockout resort collection in Cannes, Simons has done it again with the Fall 2015 couture collection. He has an obviously minimalist approach to haute couture, which at first I was nervous about (how can one be both minimalist and opulent and luxe enough for couture?) but I have come to appreciate how Simons has time and time again managed to make wearable, commercial, but no-less extravagant clothes for his couture collections at Dior. 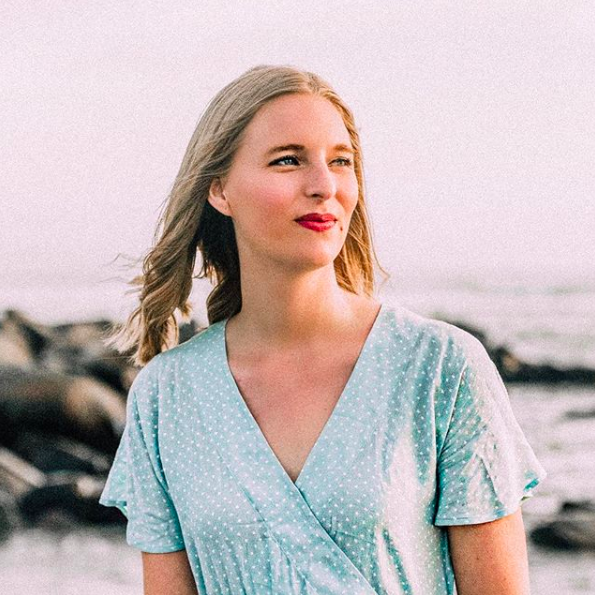 I think it's easy to confuse high fashion with high concept, and it's nice to see that there's a way to present straightforward, beautiful clothes that are going to impress. 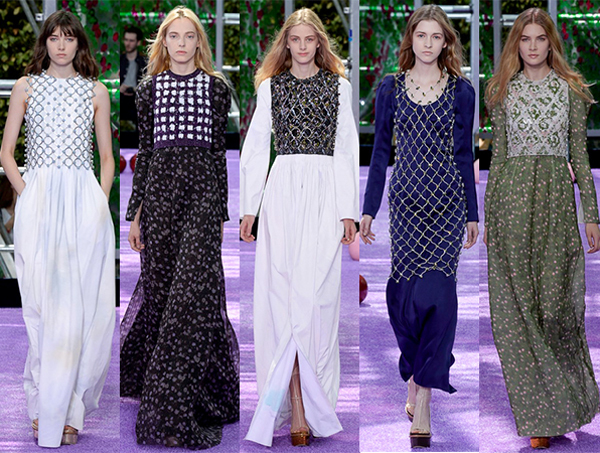 Part 60s hippie, part modern medieval princess, and with a touch of New Look tradition thrown in, this collection had a lot going on, and yet it all felt incredibly cohesive. 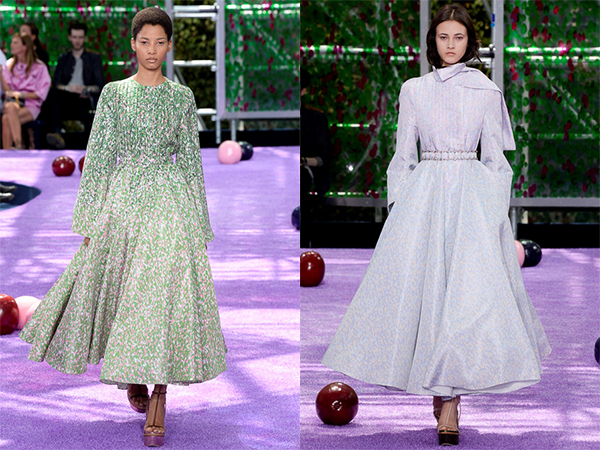 As usual, Simons has taken up Christian Dior's interest in flowers and has used fauna as the starting point for many of his collections, but here it takes a less literal approach than it has in the past. There are floral motifs here and there, and the set definitely had references to flowers, greenhouses, and naturalist painting, but it's not the petal-like creations that Simons started out with. If people were still comparing Simons' vision of Dior to Galliano's, they shouldn't be doing that anymore. This is the Christian Dior of Raf Simons, and it is incredibly successful. In fact, it's kind of crazy to think back on the days of over-excess to the point of tackiness. 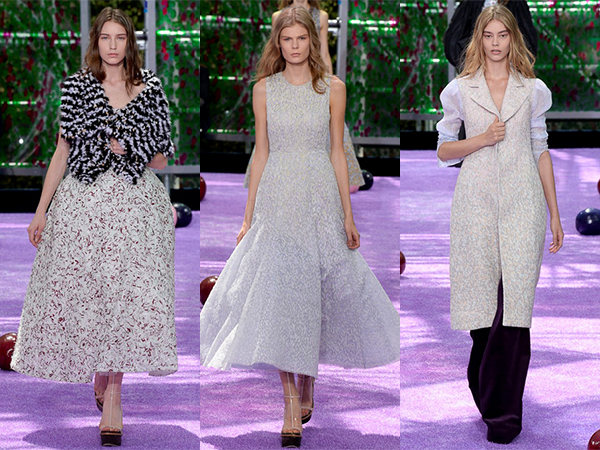 Now, Dior couture is just as luxurious, but you could actually see well-dressed women wear these pieces out and about. 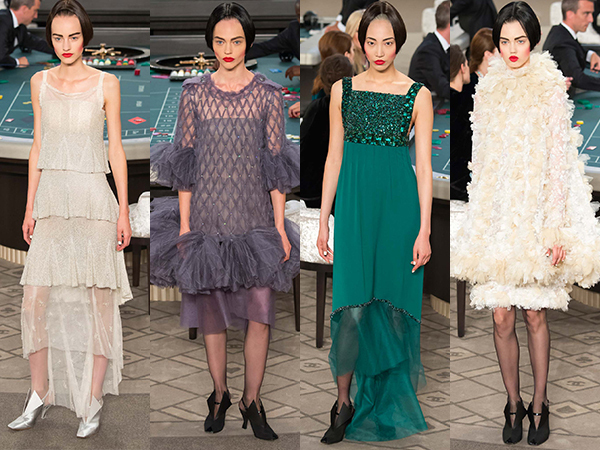 And even with couture, the pinnacle of high fashion, you should still want women to wear your clothes in real life. Simons has made that a reality. 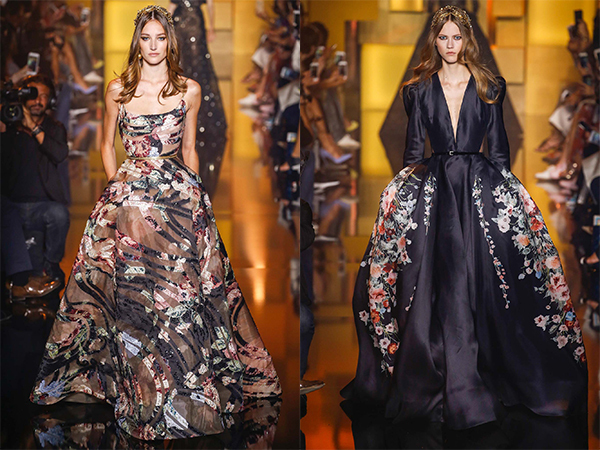 Elie Saab shows may not be cutting edge or innovative in the same way that other couture shows tend to be, but Saab has made a career out of the pretty, sparkling gowns that grace the runway season after season. One comes to expect plenty of lace, embroidery, and embellishment, and yet, each season one marvels at the fun twists in Saab's designs and the stunning color palettes. 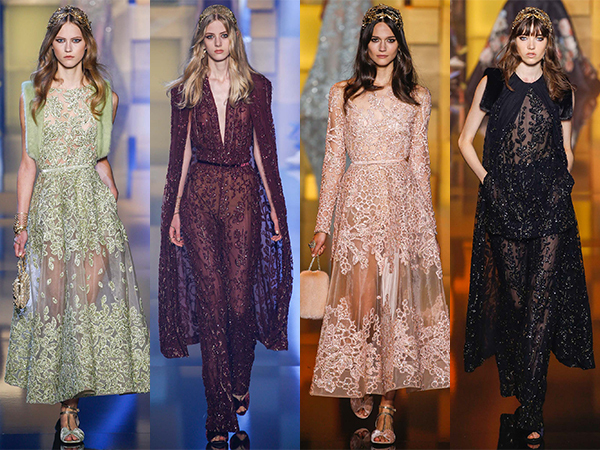 We may know what to expect out of an Elie Saab show, but we love it each and every time. For fall, Saab went a vaguely Gothic route, with a moody color palette of glittering emeralds and rich burgundies, medieval dress styles, and golden crowns atop the head of every model. He also added fur trims to the sleeves of dresses for added autumnal flare. 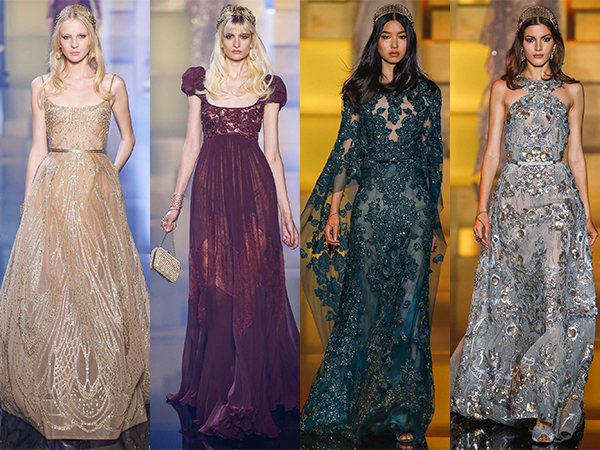 This collection will appeal to the large list of royals who flock to Saab's creations as well as Hollywood princesses. The burgundy caped-jumpsuit, for example, better make an appearance on the red carpet (perhaps the Golden Globes?) or I will be incredibly disappointed. Another beautiful turn from the man who loves to create beautiful dresses. What was your favorite collection? And be sure to check back for Part II tomorrow!